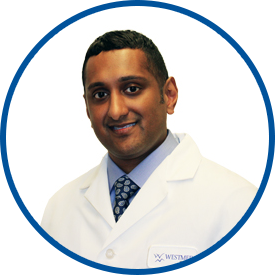 Dr. Joseph received his bachelor’s degree in biology from Fordham University, followed by a master’s degree in pharmacology from New York Medical College. He then completed his medical degree at Stony Brook University School of Medicine. After medical school, he completed an internship in general surgery at Saint Vincent’s Hospital Manhattan and a residency in orthopedic surgery at Stony Brook University Medical Center. He then completed a fellowship in complex hip and knee reconstruction at the Rubin Institute for Advanced Orthopedics at Sinai Hospital of Baltimore. His area of clinical focus is orthopedic surgery, including primary and revision hip and knee replacement, MAKOplasty robotic surgery, arthroscopic surgery, fracture management, minimally invasive techniques, and general orthopedics. He is a member of the American Academy of Orthopedic Surgeons and the American Association of Hip and Knee Surgeons. Dr. Joseph joined Westmed on May 16, 2016. *Dr. James Joseph has always provide excellent impute, advice, surgery and concern to my medical needs. Dr. Joseph was excellent. This was my first visit to his office. Dr. James Joseph has been excellent. He took the time to help me understand my condition and provided me with preventive measures I should take. In a follow-up appointment, he showed me before-and-after X-rays side by side to see my progress. I can't thank him enough for his honesty and giving me the tools I needed to heal my condition. Love this doctor very detailed with response to questions asked. Excellent doctor great guy listens to you talks with you just makes you comfortable and confident. I had a good experience during this visit. Very good bedside manner. Caring and understanding,takes his time to explain everything. Left his office very satisfied..
Dr. Joseph was professional, friendly and thorough in his explanation of my problem and the methods for addressing it. Dr.Joseph is amazing.He listens to my concerns, provides me with information on the issues I went to him for and he explains every option I have and speaks so that I totally understand what is going on with my heath issues. Very good listener & spent a good amt. of time with me. Dr Joseph is an excellent provider. He listened to my complaints, and took his time treating me and making me comfortable. He explained everything to me.